A tribute to the early Port Elizabeth art community. 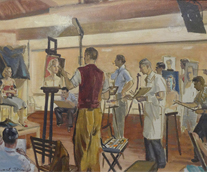 Prominent artist’s works on display include Dorothy Kay and Pickford Marriot. Background: On 22 June 2016 the Nelson Mandela Metropolitan Art Museum will have inspired art lovers for 60 years. To commemorate this momentous milestone the Art Museum is launching a series of exhibitions which will culminate in a final exhibition opening on the Museum’s anniversary.